» NHL Grab Bag: Is It Wrong to Bite Someone? NHL Grab Bag: Is It Wrong to Bite Someone? It’s always entertaining when a young player’s parents decide to get involved in his contract dispute. For some reason, it’s even better when they decide to do so via Twitter. I’m just disappointed we didn’t have social media when Carl and Bonnie Lindros were in their prime. Or, more specifically, the six fans who paid tribute to it Wednesday night in Calgary by each dressing up as a different iteration of the veteran winger. 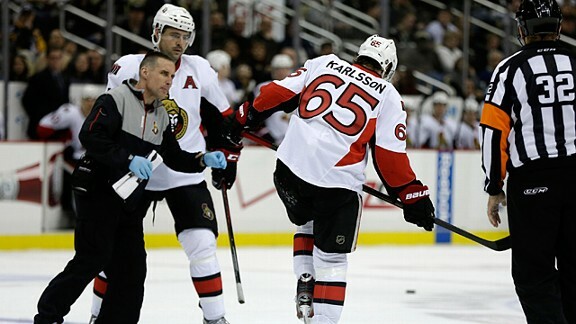 The issue: Matt Cooke sliced Erik Karlsson’s Achilles, probably ending his season. The outrage: Cooke is a monster who obviously did this intentionally and should be suspended forever, say Senator fans. No, it was clearly unintentional you morons, yells everyone else, and why can’t you deal with the loss of your best player rationally, you idiots? Is it justified: Yes, only because one of the NHL’s best players isn’t going to play for a long time. The rest of it is just predictable holier-than-thou posturing. Nothing draws out hockey fan rage like borderline dirty plays, especially ones that result in an injury. Whether you’re at the bar or on Twitter or, god help you, listening to sports talk radio, you always know what’s coming next. Wednesday night, Ottawa fans lost their minds when Karlsson went down (though at least none of them called the cops), which was the predictable Part 1 of the rage script. Part 2 was the rest of the hockey world angrily lecturing them to calm down and be reasonable, all while subtly egging them on to greater fury. We saw it earlier this week on a smaller scale with the Grabovski–Pacioretty biting incident (more on that in a minute), but the Karlsson stomp had the added attraction of featuring one of the league’s most-hated villains. So everyone lost their mind (including Sens GM Bryan Murray) and we all looked dumber for it. And no, this isn’t an NHL-specific thing, but hockey just seems to lend itself to fans going blind with homer-tinted rage. Believe me, I get it. Heck, I once sincerely argued that Scott Niedermayer embellished his injury from Tie Domi’s blindside elbow just to draw a suspension. The point is, I’m an idiot about this stuff and so are you. And since we’re all idiots when this stuff happens to our team, let’s lay off the indignation directed at Senator fans just because this week it was their turn. It only seems fitting that this week’s obscure player is Chris Valentine, the only person named Valentine to play in the NHL. Beyond his unique name, Valentine’s NHL claim to fame was scoring 30 goals and 67 points as a rookie in 1981-82, despite playing in just 60 games. That gave him a share of the Washington Capitals rookie scoring record (along with his 1981-82 teammate Bob Carpenter) that lasted for almost 25 years, until it was shattered by Alexander Ovechkin. That rookie season makes Valentine a great example of how much the game has changed. These days, averaging better than a point-per-game as rookie is almost unheard of — the only players to do it since the 1994 lockout have been Peter Forsberg, Sidney Crosby, Evgeni Malkin, and Ovechkin. Based on their rookie seasons, each of those guys was considered on the fast track to the Hall of Fame. For Valentine, his rookie numbers didn’t even buy him another full year — he played only two more partial NHL seasons before his North American pro career was over. He spent a decade playing with DEG in Düsseldorf, where his number was retired, before getting into coaching. So let that be your Valentine lesson: Sometimes, something that starts out hot can fizzle quickly. This week’s debate: Is it always wrong to bite somebody? In favor: Yes, it is. Don’t bite people. Opposed: Sure, but what if they stick their hand in your mouth? What are you supposed to do then? In favor: Don’t bite people. Opposed: But what if someone grabbed you from behind and jammed their arm halfway down your throat, how would you react? In favor: By not biting them. Opposed: Hmm. That’s an interesting approach. In favor: Honestly, how is it possible we even need to keep having this discussion? Hockey fans are the only group outside of day-care workers who have to explain the “no biting” rule more than once. Opposed: Well, lots and lots of NHL players have bitten guys. In favor: And they were all wrong. Don’t bite. Opposed: Wait, what if the biter is a guy on my favorite team? In favor: Oh, then it’s totally cool. The final verdict: Seriously, it’s not OK to bite people. Head injuries are a serious problem and it’s good to know extensive research is being done to help design helmets that will increase player safety. Having a helmet that fits tightly and securely is an important step. But while we’re at it, is there any chance we could also invent a helmet that would allow a player to do an intermission interview without looking like he was just hit in the forehead with a ball-peen hammer? If that’s not possible, is it too much for reporters to ask the player to give that thing a wipe down before going on camera? 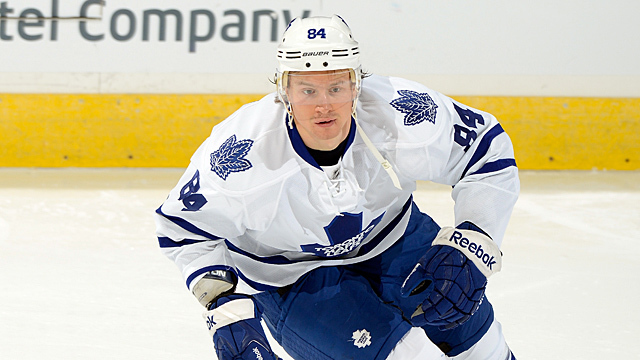 Or at least hand him a hat or a tuque or a stylish Axl Rose–style bandanna? I’m sure this player is saying something very insightful about how they’re just trying to have good shifts and do the little things it takes to win, but I’ll never know for sure because I’m distracted by the Eye of Sauron blinking back at me from his frontal lobe. 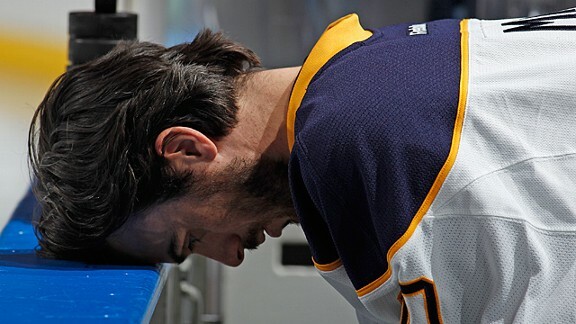 This week’s depressing CapGeek page belongs to the 2012-13 Buffalo Sabres. Two years ago, natural gas tycoon and diehard Sabres fan Terry Pegula bought the team. It was a great story because the Sabres are one of those smaller-market teams with a great fan base that had never seemed to be able to compete financially, and now they had a billionaire owner ready to throw some money around. Well, he certainly did that. He just didn’t throw it around all that wisely. Between an over-eagerness to sign anyone who’d talk to him and an apparent compulsion to hand out massive signing bonuses, Pegula’s built himself a salary cap mess. Let’s take a look. Thomas Vanek’s $7.1 million isn’t Pegula’s fault, and it actually looks like a bargain this year. Ryan Miller and Jason Pominville aren’t bad. But the rest of that list is ugly. Ville Leino (just 25 points last year, currently unable to play because of a hip injury) with five years and $22 million to go. Tyler Myers (a recent healthy scratch) in the first year of a seven-year $38 million deal. Christian Ehrhoff (a solid player nobody considers a star) in Year 2 of a 10-year deal that pays him $40 million. By the way, those last three players received a staggering $19 million in lockout-proof bonuses this year. Oh, and the Sabres already have $51 million committed to next year’s (much smaller) cap. Did we mention the team is in last place? We’d call this page the most depressing thing in all of Buffalo sports, but … well. Cherry’s Coach’s Corner appearances this week were feisty but predictable — among other things, he defended Zac Rinaldo for hitting an opponent when he was down and praised the Maple Leafs for dressing a good squad. So now seems as good a time as any to spend some time talking about his Twitter feed. If you’re not following Don Cherry on Twitter, do it now. I’ll wait. The feed is a masterpiece of harmless observations combined with classic Cherry-style vitriol, as if Andy Rooney had a love child with the crazy old lady yelling at empty seats on the subway. He’s been tweeting for about three months, already telling a rambling story about being attacked by bees and causing outrage by complaining about relief aid to Haiti. And if you’re wondering if that’s really Cherry typing out his update, it’s not — which, somehow, makes the entire thing 10 times better. It turns out that he phones a producer and dictates his rants, and they have to type them out as he goes. Is there a worse job in the world? Every 21-year-old self-proclaimed social media guru patiently trying to explain Pinterest to a 60-year-old CEO for the ninth time should fall on their knees and thank a deity that at least they don’t have to be Don Cherry’s Twitter proxy. Can you imagine being the person who has to enter stuff like this in real time? Or his recent seven-part masterpiece about meeting an especially energetic dog in Peterborough? I love Don Cherry. I guess that’s what I’m trying to say. To continue this week’s theme of love and affection, this week we’ve got an old news clip that summarizes one of the most bizarre series of events in NHL history: the infamous “have another doughnut” incident. OK, here’s what we’re watching: The Bruins have just blown out Devils in Game 3 of the 1988 Wales Conference finals, and New Jersey coach Jim Schoenfeld isn’t happy with the officiating. He decides to confront referee Don Koharski after the game. Chaos ensues. As the two men are engaging in a frank exchange of ideas, Koharski either stumbles or is shoved off-balance by Schoenfeld, depending on who you believe. This is not the weirdest part of this story. By the way, every single hockey fan remembers this quote as being “Have another doughnut, you fat pig,” but it’s not. It’s the other way around. I’m stunned by this. It’s Jim Schoenfeld’s most famous quote, and he never actually said it. It’s the “Elementary, my dear Watson” of NHL history. I like how the situation is immediately broken up by 20 guys in suits who half-heartedly try to hold Schoenfeld back while begging him to calm down. I bet every one of those guys went on to get a job breaking up brawls in the WWE. Fun fact: The cop named “Officer Koharski” who hangs out at the doughnut shop in the movie Wayne’s World is an inside reference to this incident from hockey fan Mike Myers. I like to think that somewhere, somebody from Buffalo is seeing this clip for the first time and wondering why the nice young man from those old carpet commercials is so angry. The second half of the clip covers the even more bizarre Game 4. The league has suspended Schoenfeld, but the Devils somehow get a last-minute restraining order. When they see Schoenfeld behind the bench, the game’s officiating crew refuses to work. They just go home. It’s literally minutes before Game 4 of the conference finals, and the NHL has no referees. We’re still not at the weirdest part of this story. The Devils and Bruins are already on the ice for the game and have to be sent back to the dressing room. We learn this from Bob Cole, because every great hockey moment was called by Bob Cole. Hey, it’s Reggie Lemelin! I miss 1980s goalies wearing those padded neck guards. I wonder if Ken Wregget still has his. Here’s the weirdest part of the story: The NHL’s brilliant fallback plan is to have the game officiated by three random guys, two of whom don’t have uniforms and one of whom can’t skate. Really, one of them can’t skate. He practically falls over during warm-ups. Somewhere, a young child watched those linesmen skating around in their bright yellow shirts and thought Wow, those look really sharp. That child grew up to be in charge of uniform design for the Nashville Predators. Predictably, the game turned into a gong show, which at one point included coaches on both benches threatening each other with sticks. I don’t know what Craig Wolanin did in that clip to make Lyndon Byers so angry, but based on personal experience, I’m going to guess he tried to get a word in while on TV with him. Where does this entire incident rate on the hockey world’s scale of “things that would have blown up Twitter if it had existed”? I’m think above the Red Wings–Avalanche brawl and Scott Stevens KO’ing Eric Lindros, but below the 1987 Canada–Russia WJC game and the Wayne Gretzky trade. Here another great clip about the incident with comments from some of the players involved, including Brendan Shanahan and Ray Bourque. It’s also the last known video of Brendan Shanahan where he’s not explaining a suspension while looking like he wants to swallow his own tongue. Please note the 25th anniversary of this incident is coming up in a few weeks. Make sure you have some doughnuts and a yellow raincoat handy to celebrate.